Papergreat: Automobile Night at Lake Avenue Church in Rochester, N.Y. Automobile Night at Lake Avenue Church in Rochester, N.Y. This old advertisement is about the size of an index card. It calls for people to come and hear about "Life's Traffic Rules" from Rev. A.W. Beaven on Automobile Night at Lake Avenue Church. So, what do we know about the who, when and where of this event? Searching for information about Rev. A.W. Beaven, I found that he authored a few books, including 1928's Putting the Church on a Full Time Basis and 1942's The Fine Art of Living Together. Rev. A.W. Beaven, president of the Colgate Rochester Divinity School, will give the sermon in Sage Chapel at 11 o'clock tomorrow morning. Reverend Beaven received his A.B. degree at Shurtleff College, Alton, Ill., in 1906 and graduated from the Rochester Theological Seminary three years later. In 1919 he received his D.D. degree from Shurtleff College. He was ordained at the Baptist Ministry in 1908, and a year later became pastor of the Lake Avenue Baptist Church of Rochester, a position which he held for 18 years. He then became president of the Divinity School, succeeding Dr. Clarence Barbour. Reverend Beaven developed the "Three Period Session Plan" of religious education, and was the originator of the "Wednesday Night Club" idea for mid-week devotion. He was the president of the Northern Baptist Convention in 1925, and was also President of the Baptist State Convention. He has also served as University preacher at Cornell, Yale, Wellesley, the University of Chicago and others. So, we have some good clues. We know he was pastor at Lake Avenue Baptist Church in Rochester, New York, from about 1909 to 1927. He did not, however, receive his D.D. (Doctor of Divinity) until 1919. 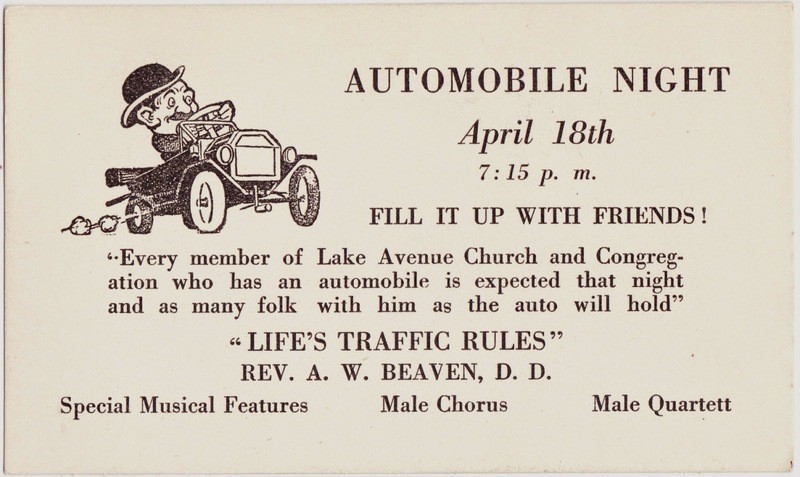 Therefore, because this advertisement connects Beaven with Lake Avenue and also notes that he is "Rev. A.W. Beaven, D.D.," I think we can correctly say that it dates to sometime between 1919 and 1927. "Under Dr. Beaven’s inspiring leadership, Lake Avenue was gaining country-wide recognition as a pioneering church, Innovations in educational programs, new forms of worship, and extended fields of foreign mission and community service marked this chapter in our history. "The Americanization program was a response to the influx of Italian immigrants into the neighborhood during the 1920s to the 1930s. Included were language instruction and a broad range of activities to personally assist families to adapt to their new environment. "An Italian-speaking congregation met in the Lake Avenue building, their minister receiving financial support from our church. This group became the nucleus for an Italian Baptist Church. Similar sharing of our facilities has occurred during the 1970′s to the 1990′s with Spanish-speaking congregations. "In the early days of radio, Lake Avenue realized the potential for new forms of ministry through the media. The church received a license and operated a radio station. Rochester’s current television station WHEC traces its origin back to Lake Avenue’s station." 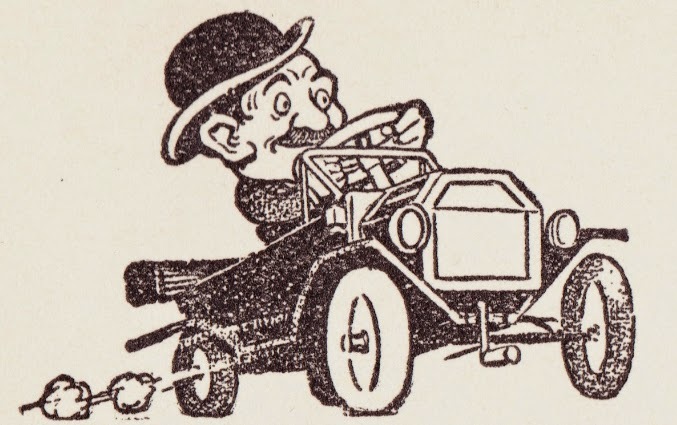 So it seems like an "Automobile Night" would have fit in nicely with the kind of innovative outreach that was taking place during Beaven's tenure at Lake Avenue.